When I was about five years old, my parents bought this little organ and brought it home. I never got to be terribly good on the thing, but I couldn't keep my hands off of it and so my parents signed me up for lessons. We had this big Irish Setter that would pee on everything, including the organ, and eventually the bass pedals wouldn't work anymore, and so I asked if I could get a bass guitar for a birthday present. I started taking lessons on that and joined a rock band as an early teenager. We played proms and homecomings and started writing songs ourselves. It wasn't long before we went into a studio to record them, and I was hooked. Before I was 20, I'd amassed enough gear to record pretty decent-sounding music at home, and even built an iso-booth in my parents' basement. 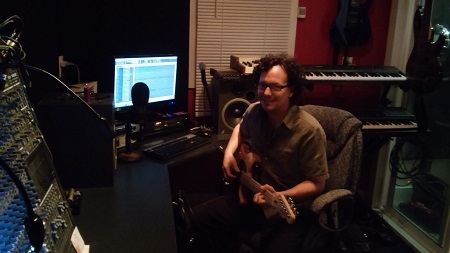 I started recording friends' music, too and began working in studios around town. I took guitar lessons, and when nobody else was available I'd eek out guitar parts for people, and was astonished when they'd smile and say things like, 'yeah, I like that!' and actually use my tracks. The banjo and mandolin followed, along with percussion and synthesizers. Eventually, folks started asking me to mix tracks they'd recorded elsewhere, and I learned how to master CDs and found that many of my clients were happy to let me do that for them as well. I took a year of music classes at Georgia State University, and learned how to write string parts by studying four-part harmony pieces from the Bach and Mozart era. Those skills transfer well to backup vocals. I played in jazz guitar labs where we'd take turns butchering Miles Davis tunes, sang in the choir there, played gigs, wrote and recorded. I didn't get a music degree (I'm a C.S. major), but I've continued taking keyboard and guitar lessons over the years, and I'm always trying to grow as a musician and writer. I still write and play live myself some, but what I really love is working in the studio with other people. Sometimes people come to my place, but in other cases clients send in mp3s of rough mixes and I dropbox parts for them to fly into their projects at whatever studio they're working in. It just depends on what people need. So what can I do for ya?